Many lottery players around the world try their luck in lotto with the hopes that one day they could live a relaxed comfortable life. Recently, Dr Peter Hayashida hit the Lotto 649 jackpot, claiming the cash prize of a mind-blowing $20 million. If you win the lottery of a jaw-dropping $20 million, would you stop working? Dr Peter Hayashida spent his life working as a cosmetic surgeon in Ontario, Canada. As a result of the life-changing lottery win, the fortunate doctor decided to hang his surgical gloves and retire early. The Pickering lotto player bought his golden ticket for the Lotto 649 draw that was due to take place on the 8 October 2016. After a few days of the lotto draw, Dr Hayashida went to check his winning lottery ticket, while doing some errands. At first, Dr. Peter Hayashida was excited for the fact that he thought he had won the cash prize of $20,000, that covered the same home renovation costs he did recently. With the shock and excitement of seeing ‘Big Winner’ on the screen, his mind started to play tricks on him. “I saw BIG WINNER on the screen but needed to use another ticket checker to be absolutely sure. 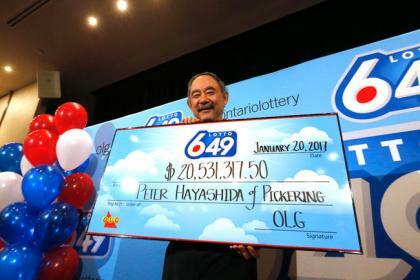 I was so surprised and in total shock,” said Dr. Peter Hayashida while claiming his prize at the OLG Lottery office. Recalling the second lottery ticket check, the retired surgeon said “I scanned the ticket again and counted the zeros. At that point I go, ‘Oh my gosh.’ As soon as Peter arrived home, he told his wife who was shocked of the life-changing news. After the big reveal to his wife, Hayashida kept the big secret under wraps for the past few months until he was ready to reveal the news publicly. He sorted out his personal affairs by hiring an accountant to guide him on the bright future ahead and to look for someone to take over his clinic. “I want to do good things with this money. This money secures my family’s future and will help take care of others too. My dream is to eventually set up a charitable trust or foundation,” explained Dr. Peter Hayashida. Now that he will be retiring early, Peter intends to travel with family and friends to exotic places.